I also included some other neato cereal-related items to this gift guide. We have some Funko pops, clothing, a card game, some Christmas ornaments, and more! Looking for a breakfast cereal and colon cleanser all-in-one? Poop Like A Champion delivers! One half-cup serving of this cereal has a whopping 16 grams of fiber! This is unheard of and totally intriguing to me! And a bonus? It is also gluten-free! One thing to note here though is that this cereal is not made to taste great. It is made with a purpose and that is to clean the gunk out of your guts and insides. Let’s face it… sometimes it needs to be done. This breakfast cereal would also make for one tremendous gag gift! If you are going to Poop Like A Champion you are going to need a giant 24 oz. poop emoji bowl! Here is a super adorable cereal for all of the unicorn lovers out there! I know you are out there too because nowadays unicorns are all the rage. It is a trend and I never want it to die out! This cereal was created by Kelloggs and it is a limited edition. I have a feeling that you have a little girl in your life that would be over the moon thrilled to have a bowl of unicorn cereal for breakfast. Here is a fun breakfast cereal for Y’all! This is a sweet oat cereal with marshmallows that are in the shape of unicorn horns, trombones, & booties! Booties??? OMG! This is one box that you are going to want to keep and save. It also has a “booticorn” mask on the back. This Clark Griswold Christmas Vacation breakfast cereal from Funko is perfect for the holiday season. Christmas Vacation is hands down my all time favorite Christmas movie. I can watch it once a week leading up to Christmas and not get sick or tired of it. The film is a classic and it is sure to make anyone laugh and smile. This is a limited edition FYE exclusive cereal but I was able to locate in on Amazon. Here is a limited edition Lucky Charms breakfast cereal that is chocolate flavor. Lucky Charms were a fave when I was growing up. I have a feeling that this chocolate flavored box of them is sure to delight any Lucky Charms fan! Here we have a limited edition Cinnamon Toast Crunch cereal that is sugar cookie flavored. I don’t think you can go wrong with this. That flavor sounds perfect for the holiday season. And another fun one from FUNKO! This one is Beetlejuice… another classic! Here is a unique cereal that I have never seen before and there is also a 25% off clickable coupon available. Woohoo! This is a healthy cereal that I had to throw in here. This one is jam-packed with 11 grams of protein per serving. Be sure to check out the variety pack available. This also has a 25% off clickable coupon so you can save some money. Monster Cereals 2018 3 Pack Count Chocula, Frankenberry, Boo Berry – Back for Halloween! It is a crying shame that these cereals by General Mills are often only usually available during the holiday season! When I was a little girl these were always my go-to cereals. Even the milk is delicious and yummy to drink after you polish off your bowl of cereal. The Franken Berry makes a mouthwatering strawberry milk in your bowl. Drool! Be sure to also check out the monster cereal plushies available: Count Chocula, Frankenberry, and Boo Berry. There are also monster cereal t-shirts available on Amazon. Boo Berry, Count Chocula, Frankenberry, andÂ Midnight Munchies (features all 3 characters). I have included some Amazon shopping links below for some fun monster cereal products, including some limited edition Funko Pops. And for those General Mills Halloween cereal fans there is also a card game available on Amazon that features your favorite Halloween cereal spooks! Be sure to check out the big g creative Monster Crunch! The Breakfast Battle Game on Amazon! Here we have another high fiber breakfast cereal and I gotta say, the name of this one really grabbed my attention- CRAPOLA! This is actually an artisanalÂ breakfast cereal that sounds delicious and they are produced in small batches to ensure the highest quality. The flavor of this one is Cranberry Apple and this sounds like a great cereal to chow down on in the fall or winter. Check out these other yummy flavors of Crapola breakfast cereal. The flavor combinations sure sound like a winner to me! Hodge Podge! Other fun breakfast cereal items! 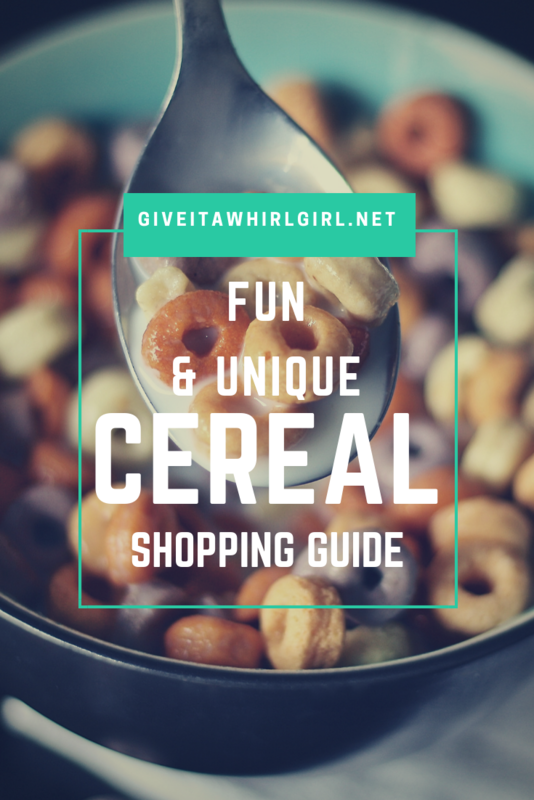 And lastly, I am adding some Amazon shopping links for some other fun breakfast cereal items that I found on my mission to bring you awesome cereal-related products! Simply just click the links or the images below to shop. How cute is this cereal ornament from Kurt Adler? It is a big bowl of Fruit Loops and it says, “I HEART CEREAL”. I would love this Christmas ornament in my collection. Kurt Adler makes some really fascinating Christmas ornaments. Here we have Lucky The Leprechaun from Lucky Charms. This is a collectible Funko Dorbz figure. Here is a fun shirt by Pynkic for all of you CEREAL KILLERS out there! There is also a men’s shirt available and a unisex sweatshirt. Another awesome Christmas ornament here and this one features Toucan Sam from Froot Loops! Here is a super fun pair of leggings made by World of Leggings. These leggings are rainbow colored and have a Froot Loops design printed on them. You are going to need a coordinating top to go with those fun leggings. Here is a hooded sweatshirt with the words CEREAL KILLER imprinted on it and a bowl of Froot Loops. What is your favorite breakfast cereal from this shopping guide? Which one will you be giving a whirl to? Leave me a comment and let me know what’s on your mind. This entry was posted in Manic Monday, Shopping Guide and tagged acai, amazon, Beetlejuice, big g creative, Boo Berry, breakfast, card game, cereal, cheat day, Christmas Vacation, Cinnamon Toast Crunch, Clark Griswold, clothing, Count Chocula, coupon, Crapola, fiber, Frankenberry, Froot Loops, Funko, General Mills, gift, gift guide, Golden Girls, granola, Halloweeen, Joybol, Kelloggs, lucky charms, Lucky The Leprechaun, poop, protein, Pyknic, shopping, shopping guide, smoothie, sugar cookie, Toucan Sam, unicorn. Bookmark the permalink. Thanks for checking it out. 😎😎 I got into blogging in June and love working on posts and sharing them. No problem! Can’t wait for more of your posts! There sure are a lot of interesting (or, in some cases, strange) cereals out there. Definitely! I had a lot of fun looking around on Amazon for them. (Fun & Unique Breakfast Cereal – Amazon Shopping Guide) Wow! I have never hear of this cereal before; Poop Like A Champion – High Fiber Cereal.Man do I ever need this cereal! Oh wow, these are awesome and hilarious! The Poop Like a Champion one.. Hahahahahaa!! !